Cooking for three people can get unnecessarily tiresome when I don’t eat meat, my husband expects a surprise every now and again, and our helper craves rice at every meal (even breakfast). No complaints though as she’s happy with the simple fare of her Yangon home eg roselle leaves fried with garlic/onion/chilli. To add to this I’m too lazy for anything fiddly except when my son and his fiancée drop by for Sunday dinner, and even then, I opt for a stew, roast, or some other one-dish meal like Vietnamese rice paper rolls or sweet & sour pork. I blame my lethargy on the haze and humidity. Was it this hot when I was growing up in the 1960s? I cannot remember but most likely not. Back then, the Singapore population was just over 1.6 million against today’s 5.5 million plus we have global warming, not helped by the raging forest fires nearby. But I digress from my fish custard. The preamble is to explain why I have dishonoured my Nonya heritage by forgoing the traditional coconut or banana leaf wraps. My late grandmother had a sense of humour. She would have twisted my ear and laughed at my shameful attempt to recreate otak-otak (puhlease, we don’t say otah) by using (horrors!) frozen white fish and dumping the ingredients in a baking dish. My husband who doesn’t know any better, said it was good. Phew! And actually, it tasted fine especially as I didn’t flake the fish. Leaving it in cubes gave the dish more texture. This no-fuss casserole-style dish is an easy way to enjoy fish with the appetising aroma of blended herbs and spices and a hint of banana leaf from the liner. Cube fish. Chop up if you like it fine. Set aside. Prep ingredients for grinding by skinning galangal if using fresh root, peel and slice onions, use white bulbous base of lemon grass (about 5cm) and throw the hard root end away. Slice galangal and lemon grass or you’ll get a ‘hairy’ mix after blending. Grind candlenuts, chillies, and lemon grass. 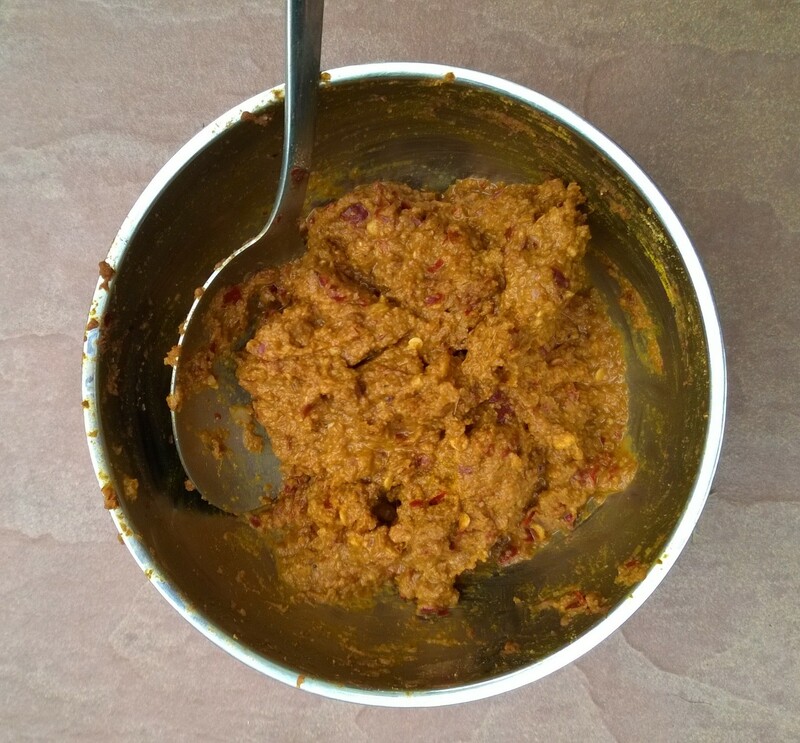 When it’s fairly fine, add onions, prawn paste and powdered spices. Heat a pan and fry the ground paste in about 3 tablespoons oil till fragrant and glistening. Turn down heat, add coconut cream and give it a good stir to mix well. Take off the heat and when cool, mix the egg in. 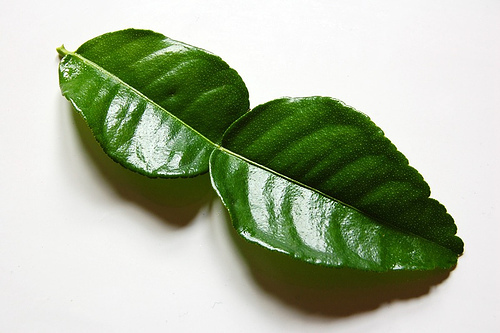 Throw away the hard vein of the kaffir lime leaves, and slice leaves into fine strips. Mix sugar and salt into spice mix and fish along with a sprinkling of kaffir lime leaves. Line a baking dish with a banana leaf (scald in hot water first) and fill with fish mixture. Pour enough hot water into the baking tray to reach half way up the dish. Bake for 25 minutes in a pre-heated oven (175˚C). Note: If using frozen fish, the custard might be a little watery. Gently tip the dish and drain off as much liquid as you can without breaking up the custard. It will dry up as it cools. Or be a purist and use fresh fish – Spanish mackerel (tenggiri) is the usual choice. But taste-wise, frozen works fine when you have a craving for otak and it’s all you have. 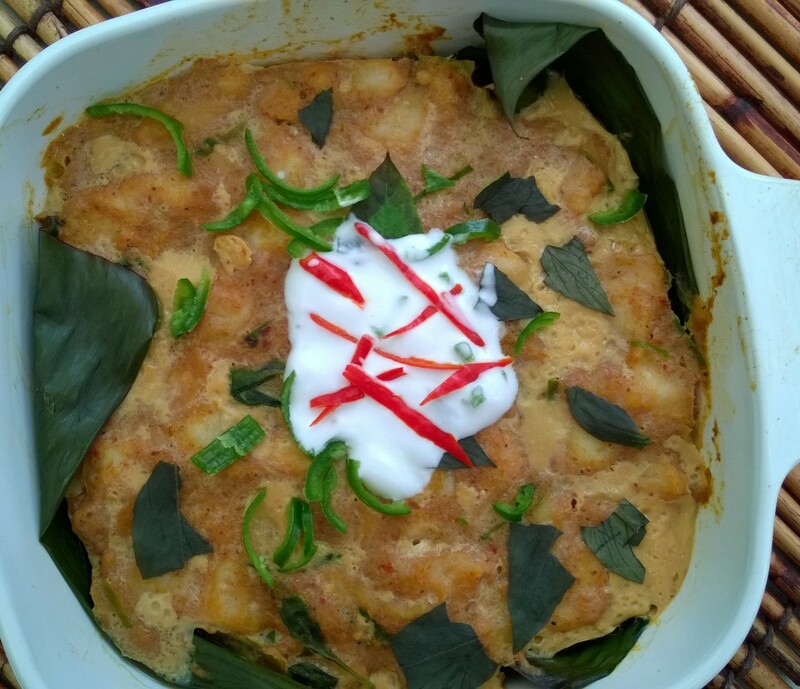 While I was in the mood for fish custard, I decided to make some Hor Mok (the Thai equivalent) in the same lackadaisical way – after all, how much lower could I go? So, I dispensed with the delicate banana leaf cups and slapped everything into another dish for steaming. Again, it’s not as pretty but it makes a dang good side dish without having to cut banana leaves and pin with toothpicks. Just don’t serve it to Thais or fussy bibiks. Looks strange, but tastes fine. Presentation needs improvement. Add the coconut cream and most of the thinly sliced kaffir lime leaves, saving some for the topping. Mix well. Line your container with a banana leaf, and cover the base with a bed of shredded cabbage and Thai basil leaves. Add the fish cubes and then the custard. Steam for approximately 15 minutes, or until the fish is cooked through. Wrap the pot cover in a tea towel to stop water from dripping and pockmarking the custard.